The Volcano Rabbit (aka Teporingo, Zacatuche, Romerolagus diazi) is an endangered lagomorph that lives on high volcanic slopes outside of Mexico City. While the biggest threat to their survival is habitat degradation and target shooting, it is suspected that climate change also threatens these small slope dwellers. The rabbits live at high altitudes, but increasing temperatures may drive them higher, until there is eventually nowhere left to go. "The volcano rabbit is one of the smallest rabbits in the world. It has rounded ears, eats leaves and bark and what domesticated crops it can get its teeth into, and makes a high-pitched sound rather than thump its feet to signal danger. It is most active at dusk and dawn. The rabbit lives only on the pine-studded slopes of four volcanos near Mexico City, and there only tenuously: it's being pushed up the mountain slopes by habitat encroachment, overhunting, and climate change. Mountains being what they are, the rabbit is running out of room. It's fast becoming another symbol of the manifold ways in which human activity threatens the planet—of the new geological epoch, the Anthropocene, that scientists have begun calling this period of mass extinction and global warming. The volcano rabbit is also a muse. 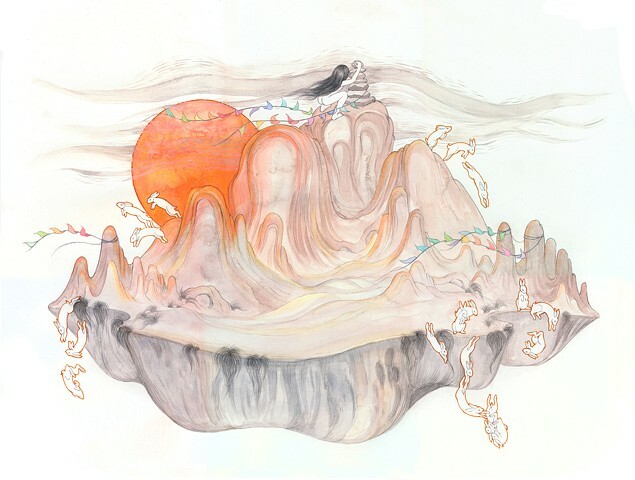 The creature figures into a painting by the Chicago artist and environmental activist Jenny Kendler, whose Climate Change (Volcano Rabbits) features a woman stacking stones atop a mountain—trying to extend the rabbits' habitat upward while they hop wildly around the mountain and off it. The painting is part of a series, "Archipelago," inspired by the field of island biogeography, which studies bounded habitats—islands, but also places like mountaintops—to understand how ecosystems develop in isolation. Other subjects Kendler painted for the series are a group of slaughtered narwhals magically rescued from their pursuers, and a hummingbird feeding from a woman's ear." - Sam Worley for The Chicago Reader in "The Natural Selection of Jenny Kendler"